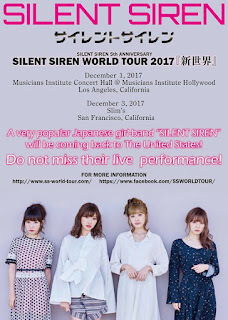 Silent Siren's U.S.Tour Starts Friday in Los Angeles, California! Silent Siren will be returning to the U.S.A. for their second appearance this weekend! Starting Friday December 1st in Los Angeles, California. Following on that Sunday December 3rd in San Francisco, California. Find out where and pick up your tickets below!